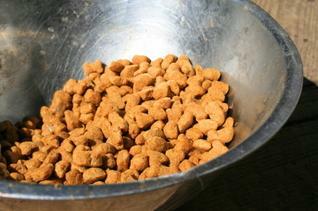 "How much should I feed my dog?" That's a question asked by many pet owners, but the answer varies according to many factors. Commercial dog food brands all have different ingredients and formulations, so it's difficult to provide a single guideline that addresses how much to feed every dog. Even so, each brand does offer its own feeding recommendations on every bag of food, and this information is based on several size ranges. The challenge in following those recommendations is that each dog is also unique, and the amount that may keep one dog in healthy condition may be different for a similar sized dog with a higher or lower metabolism. Here are a few factors the affect how much a particular dog should be fed. Age plays a significant role in how much you should feed any pet. Puppies generally have higher metabolisms and higher nutritional requirements than adult dogs and senior pets. They need enough food to help them through the rapid growth phase on their way to adulthood. Adult dogs that have reached their full size potential need just enough food to maintain them at their proper weight and condition. Senior pets typically slow down as they age and require a little less food than the average, active adult dog. Take your dog's energy and activity levels into consideration as you try to determine the right amount of food to feed him. Highly active dogs burn more calories, so they will require a greater amount of food than more sedentary pets. Working dogs, show dogs and canine athletes are just a few examples of pets that require extra nutrition to keep them in top condition. A dog's weight can actually be an arbitrary number. Breed descriptions often include average calculations about the expected weight and height of the dogs being discussed, but this is only generalized information. It's healthier for your pet if you consider his weight in relationship to the size of his frame. If you can feel your dog's ribs, chances are he's a little underweight. On the other hand, he may be overweight if he seems to have excessive padding and you can literally feel rolls of flesh. If your dog has been diagnosed with a specific health condition, it's best to consult your vet directly about exactly what and how much you should feed your pet. Dogs burn calories to keep warm, so dogs that spend most of their time outside in kennel situations require additional food during the cold winter months. Dogs that live indoors will not require extra food and may even require a little less if they receive less exercise during the winter. So, How Much Should I Feed My Dog? As you can see, there is no firm answer to the question "How much should I feed my dog?" You really need to consider your individual pet's circumstances and condition before you can decide how much food he really needs. It's generally a good policy to begin feeding your dog according to the recommendation on the food's label, and then track your dog's overall condition to see if this is the right amount for him. If your dog seems to maintain his ideal weight, you can stick with those recommendations. If your pet loses weight and begins to seem too thin, try feeding a little more, perhaps 1/4 to 1/2 cup more each day, and check his condition again in three to four weeks. You may need to make further adjustments. If your dog gains too much weight when fed according to the brand's recommendations, try decreasing the daily amount you feed by about 1/4 cup, and check him again in three to four weeks. If he feels like he has a good ratio of body weight to his frame size, you can continue feeding him that amount. If not, adjust accordingly and check in approximately another month. The idea is to eventually determine the ideal amount you need to feed your pet to keep him in healthy condition. So, it's a process of trial and error, but it will be well worth your effort.